Lightning crackles across the night sky creating electrified branches that illuminate the darkness. Surging downwards to earth, these bolts are captured by massive rods, their destructive energy harnessed into a life-giving force. Overseeing this Promethean act of taming nature, an unnamed scientist watches as his child-like corpse creation is shocked into existence. And perhaps, like Frankenstein’s monster before him, that is the fictional story of how the Cadaver Kid came into being. “He was inspired by the Frankenstein mythos”, Joe Merrill states about his Cadaver Kid sculptural creation, “with some stylistic inspiration lent from characters and toys like Madballs and Rat Fink“. A graduate from Columbus College of Art & Design who had no formal sculptural or figure making training, Merrill created the Splurrt alias in 2007 with his debut form coming in resin the following year. Evolving his own style and aesthetic through a series of resin cast editions (learn more here), Merrill’s first vinyl cast sculptural edition was issued in the summer of 2011. And that form was the Cadaver Kid. In conceiving this creation, “I imagined the innocence of a child, unaware that he may be a freak or monster, or reanimated and stitched together from corpses that were not originally his”, recalls Merrill. “None of that matters to him, he is just happy to be alive and experience life”, the artist explains, “despite his situation he lives in a state of wonderment observing the world”. In September of 2012, Merrill introduced an evolution of the form, an alternate head for the original’s body that reformed his creation into the Mecha Brain Cadaver Kid. And within the artist’s narrative for the piece, this new rendition reflected how the “creator who made the Cadaver Kid was continuing to operate on him, playing with his brain and cybernetic enhancements to increase his intelligence, but that the experiment went awry and the mechanical brain components malfunctioned, leaving Cadaver Kid in kind of a zombified state”. 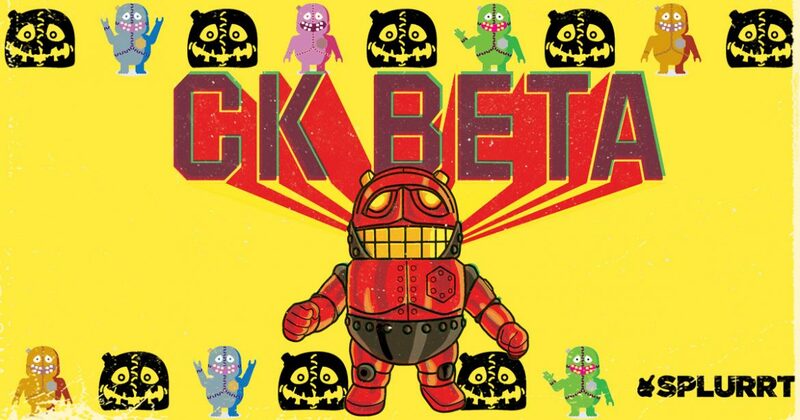 First publicly displayed at 2017’s DesignerCon, “CK Beta is the newest exploration in the Cadaver Kid narrative”, says Merrill. “I had the thought that the Cadaver Kid‘s body continued to be in a state of decay, and that slowly his body would continue to rot away”, reflects the artist, specifying “that in order to save him, he needed a new vessel to transfer his consciousness into”. And, of course, what’s better than “a robotic body that could last forever”? As for how this newest concept evolved, CK Beta “is very much inspired by Japanese Super Robots”, according to Merrill. “Admittedly I’m not a Chogokin collector and my knowledge of different Japanese robots isn’t as robust as many collectors”, he says, adding that “I do have a handful of Tetsujin toys and I think it’s safe to say I drew a lot of inspiration from that”. As for the process of creating the CK Beta, “I contemplated many different ways to do it”, remembers Merrill. “I actually thought about trying to do it as a snap-together model kit or going the 3D sculpting route”, he admits, “but what I’ve always enjoyed about Japanese soft vinyl toys is the human error I see in the hand-sculpted form”. And that realization ultimately led him to sculpt the master out of clay, which is what the molds for the vinyl editions were made from. Noting that the “CK Beta is little bigger” than the previous 4-inch tall iterations, Merrill remarks on how he “maintained the same neck joint, so you can plug Cadaver Kid and Mecha Brain Cadaver Kid heads onto the body”. And while Merrill hasn’t “named any of those combinations yet”, he doesn’t hide the fact that he is “a big fan of the Mecha Brain head on the body”. Making its debut in small editions of unpainted green vinyl and hand-painted camouflage renditions, as well as some other surprise versions, the CK Beta is a clever robotic re-interpretation of the original’s cadaverous form. While “the similar short and stocky body type” is an obvious correlation, Merrill notes that “the screw shape still exists on the chest” and how “there are still seam and panel lines that are almost in identical positions to the stitches on the Cadaver Kid“. Harboring a similar gleeful smile, CK Beta has a much more heroic pose and feel than his predecessors, a choice that Merrill likens to “a kid pretending to be Superman or Batman“. And perhaps it is indeed a new dawn for Merrill’s Cadaver Kid creation, having shed his failing flesh and donned a superheroic robot suit. But, most importantly, CK Beta maintains the true heart of it’s lineage: the sympathetically shaped eyes that denote a sense of wide-eyed wonder. Click here to acquire Splurrt’s CK Beta on Saturday, January 13th, 2018 at 1pm Eastern time.